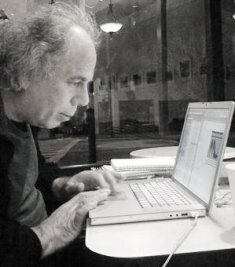 Dennis Bernstein is a long-time, front line reporter specializing in human rights. His articles have appeared widely in such publications as the Boston Globe, the New York Times, The Progressive, and the Nation, and he was chosen by Pulse Media as one of "20 Top Global Media Figures of 2009." Dennisâ€™s artist books, co-authored with Warren Lehrer, are in the Special Books Collections of the Museum of Modern art in New York City and other major museums around the world. His first full collection of poetry, Special Ed, was just released by New York Quarterly Press; read reviews here. Dennis lives in San Francisco. I love the line "on freshly minted wings." Bravo! This poem pulses with motion. Thanks. I wish I could be there! Very nice! Reflective. I caught the suggestion of the Trinity from the three red-tails. Nicely done.